Multi.X comes in a concentrated formula capable of removing all manner of filth and unwanted soiling! CARPRO recommendS diluting 1:20 for general cleaning or 1:100 for high pressure cleaning applications. Please note it's HIGHLY recommend that you test on an inconspicuous are of any material before use! Use on unknown materials only at your own risk! As is the case with much of the CARPRO line, the products function in a full circle, meaning you can use this product as a pre wash cleanser but you can also use this product at the end of the wash cycle for deep cleansing and removal of many types of stains on a protected surface. 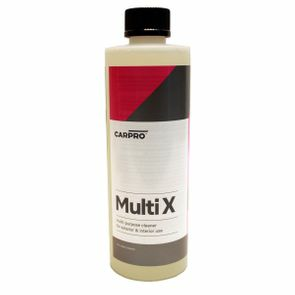 CARPRO Multi X should always be diluted to suit the task and surface applied to. With its citrus scent Multi X not only smells fantastic but offers a great deal of versatility with uses both on the interior, exterior, engine bay, and more!